Mapo Tofu (麻婆豆腐, mápó dòufu) literally translates as “Pockmarked Grandma’s Tofu”. 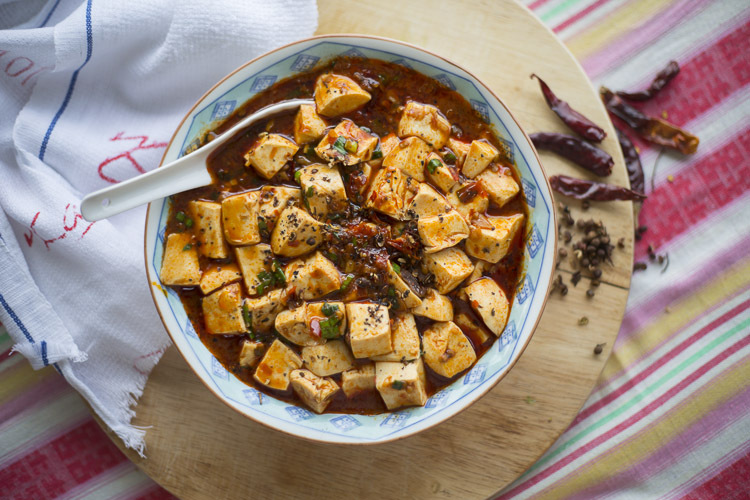 While the name may not entice, this dish’s genius lies in the contrast between bland, pillowy cubes of poached tofu and the crimson chilli-spiked sauce they’re bathed in. The combination is intensely moreish – just so long as you like it hot. 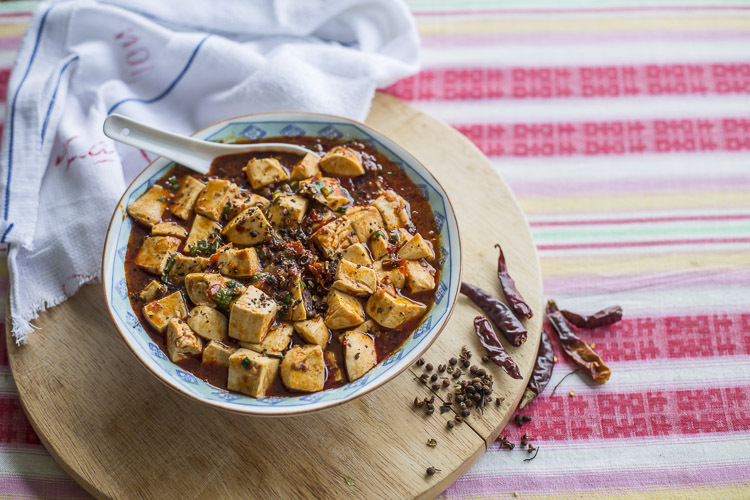 A classic Sichuanese dish, mapo tofu is spiced by chilli pepper and Sichuan pepper. The chilli gives the dish its heat, while the fragrant Sichuan pepper (known as 花椒 huājiāo or “flower pepper” in Chinese) creates a numbing, tingling sensation on the lips that is one of the hallmarks of Sichuanese cuisine. Today, mapo tofu is popular throughout China and can be ordered in Chinese restaurants around the world. The flavours are often tweaked and diluted to suit local palates – Hong Kong’s chefs are inexplicably wont to add peas and diced carrot, for example. This version omits the original’s ground pork, but is otherwise true to its roots. Serve it with rice to cool your flaming lips, and prepare to get addicted. 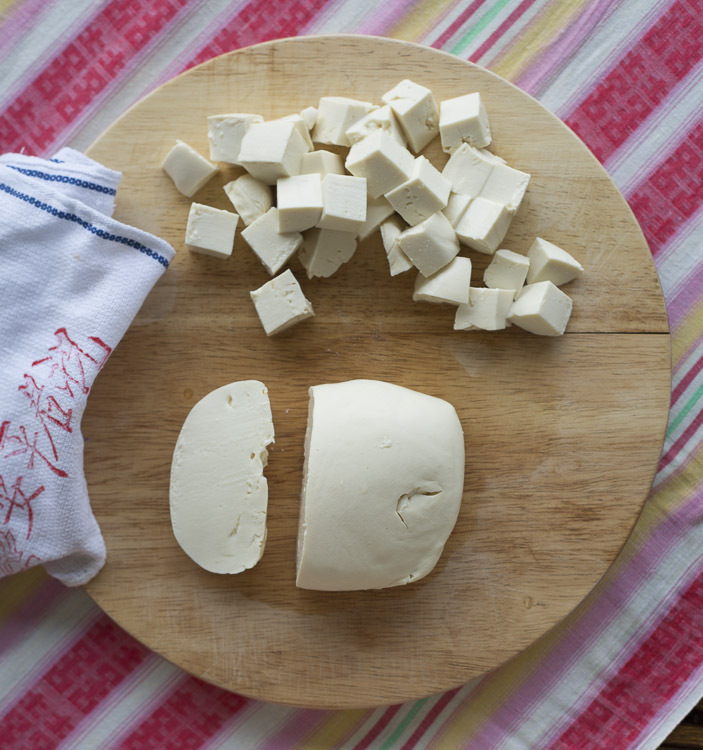 Bring a saucepan of water to the boil while you gently cut the tofu into 1 ½-cm (½-inch) cubes. Take the pan off the heat and slide the tofu cubes into the water. Let this sit and warm through while you prepare and cook the sauce. Heat a clean wok on a medium heat and dry fry the Sichuan peppercorns until they start to smell good, then remove from the heat and grind with a mortar and pestle (or, if you too have an under-equipped kitchen, a bowl and the end of a rolling pin). 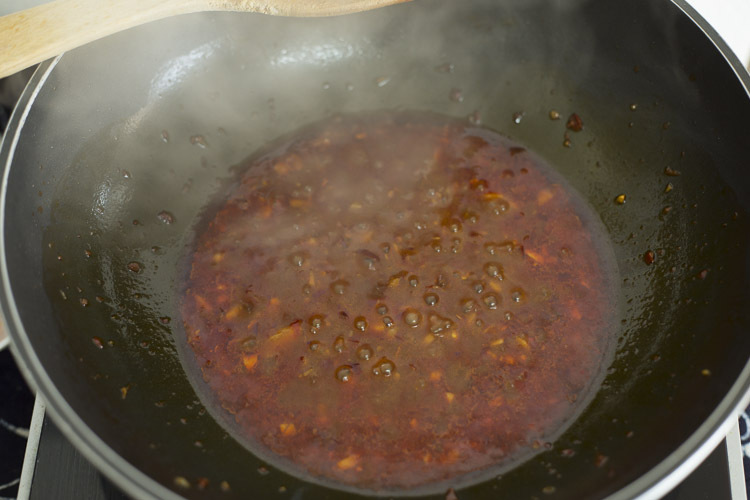 Pour a tablespoon of oil into the wok and heat it over a high flame, before adding the garlic and ginger. Once these become fragrant, add the doubanjiang, soy sauce and stock (I just ladle in some of the water from the tofu). Stir until everything is well mixed and taste – the doubanjiang is often salty enough by itself, but you may want to add some additional salt. 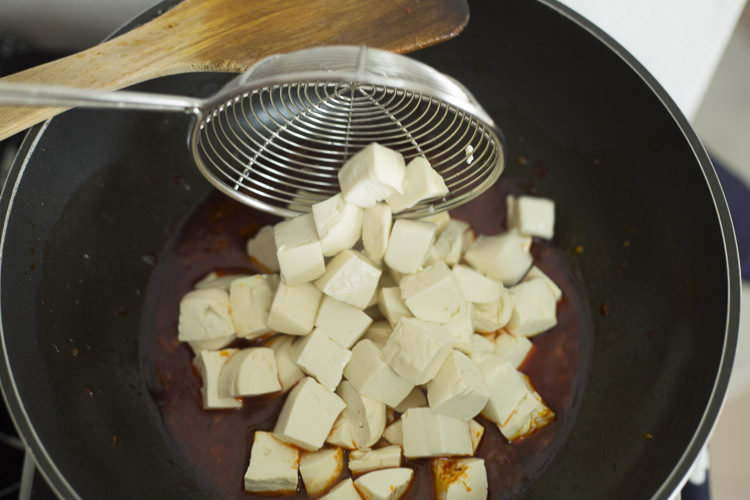 While the sauce bubbles away, carefully drain the tofu and add to the wok. Gently toss the tofu in the sauce and try not to break up the cubes if you can help it. Add the cornflour thickener and the spring onions, and continue to stir it all gingerly until the sauce has thickened. Decant the contents of the pan into your serving dish, and sprinkle it with ground Sichuan Pepper. Serve and enjoy! “Tofu” is the Japanese pronunciation of these two characters: 豆腐, which are pronounced “dòufu” in Mandarin. So tofu = dòufu = beancurd. Tofu comes in a wide range of disguises, from chewy dried sheets of dòufu pí (豆腐皮, tofu skin) to spongy slabs of dòng dòufu (冻 豆腐, “frozen tofu”), but if a recipe calls for plain old ‘tofu’, it is probably referring to the blocks of solid, white beancurd that come in varying degrees of firmness. 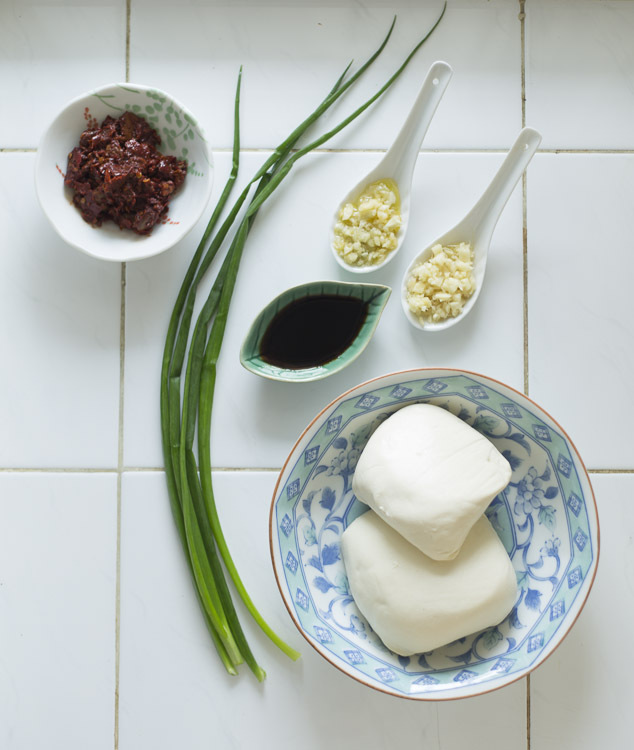 The most delicate form – silken tofu – is best for steaming or adding to soup, while firmer varieties hold their shape better when fried. For this dish it doesn’t really matter which kind you use, though you’ll need to be especially gentle if you’re using silken tofu, to stop it all disintegrating into a spicy tofu sludge.